Tennis is a sport that I love to play and watch. You will find me on the tennis court at least three times a week, sometimes four or five times. I got an injury last spring right before Memorial Day that prevented me from playing for nearly three months. After weeks of physical therapy, I'm happy to say I'm back on the courts. Because I enjoy tennis so much, I've always wanted to write a story in which one of the characters was a professional tennis player. 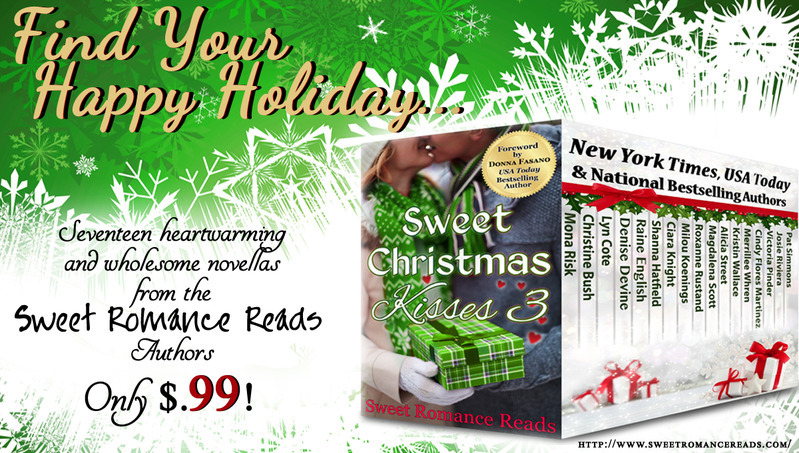 When the opportunity came about to be part of the Sweet Christmas Kisses 3 boxed set, I knew exactly what my contribution would be. 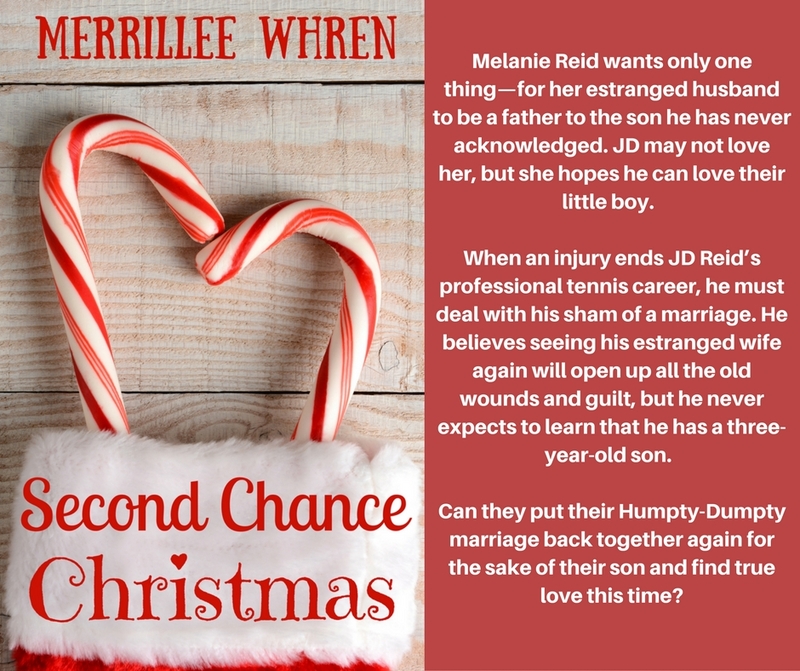 Second Chance Christmas is a heavily revised version of something I wrote years ago. I've always loved this story, and now I can share it. My hero has an injury that ends his professional tennis career, and he has to make some life-changing decisions. I hope you enjoy reading this first chapter. “Out here,” her sister called from the cedar deck at the back of the house. Looking out the wall of windows in the family room, Melanie spied Chris sitting on one of the blue-and-white striped chairs surrounding an umbrella table. As Melanie opened the French doors leading to the deck, the folded paper seemed to burn a hole in her pocket. She wondered what Chris would think when she saw it. “Fine.” Melanie touched the paper again. Moments later Chris returned carrying a tray containing Melanie’s lunch and two glasses of iced tea. “Thanks.” Biting into a strawberry, Melanie savored its sweet juice. “You’re certainly quiet. Something on your mind?” Chris raised her eyebrows so they disappeared beneath the fringe of light-brown bangs. “They were handing these out this morning at the pro shop.” Melanie offered the paper to Chris, who took a seat beside her. “No.” Melanie sighed, twisting the plain gold band on her left hand. Melanie gave Chris a faint smile. Swallowing a lump in her throat and closing her eyes, Melanie fought back the tears. “What do you intend to do?” Chris asked. “I’m going to talk with him.” Melanie steeled herself against the hurt. She didn’t want to face him, but she had to. Melanie sat without speaking for a few moments. The sound of the waves breaking on the beach at high tide filled the silence. Could Chris ever understand any of this? Melanie wondered whether she understood it herself. Her rebellion against her family had led her into this marriage. Now that she had reconciled with them, what did it mean for a marriage that hadn’t been a real marriage in years? “I guess I can’t do or say anything to change your mind, but I hope you aren’t making a mistake.” Chris knit her brow. “That’s what I’m afraid of.” Chris shook her head. Melanie gave Chris a big cheesy grin as she hurried into the house. The boards of the deck were warm beneath her bare feet as she made her way toward the beach. When she crossed the warm, loose sand near the dunes, the breeze ruffled her hair in several directions. Watching the waves chase each other on the incoming tide, she came to the ocean’s edge, where the cool water flowed over her feet and eroded the sand out from under them. Wriggling her toes down into the soft wetness and letting out a deep sigh, she looked ahead at the bright-blue sky and cotton-puff clouds, a scene fit for a postcard. She’d been looking forward to a few relaxing days here leading up to Thanksgiving with her extended family, but what would happen now that JD was here, too? Finally, she tore her gaze from the ocean and started walking toward the hotels and condominiums. People strolled along the beach. A few tourists were stretched out on beach chairs or sitting under brightly colored umbrellas. She paused to watch a family engaged in building an elaborate sand castle. The father and son worked side by side as they built the wall. She wanted Danny to have the chance to share these kinds of moments with his father. Was there any chance that JD had grown up and changed, as she had since she’d seen him last? Could she hope that he would finally want those things, too? She shook the wishful thoughts from her head as she walked toward the water. Holding the kite high in the air, she let out a few feet of string. The breeze caught hold of the kite, and the reel of string unwound in her hand. The colorful kite soared higher against the blue sky. She ran along the beach, her eyes on the kite. Suddenly she crashed into a well-muscled male body, jarring the breath from her lungs. A large hand dug into the tender flesh of her upper arm, and the kite escaped her grasp. Out of the corner of her eye, she saw it flutter to the ground near the dunes where sea oats swayed in the breeze. Finally catching her breath, she turned to the man. Her apology died on her lips as she gazed into a pair of familiar, angry brown eyes. “Don’t you kids ever watch what you’re doing? You think you’ve got the whole beach to yourself?” His irate voice echoed in Melanie’s ears. She’d heard those same angry tones the last time JD had spoken to her four years ago. Her legs nearly gave way, and she was thankful for the support his grip offered. She searched his face for some sign that he knew her, but there was none. Her stomach clenched, and she couldn’t think of a thing to say. He doesn’t even know who I am. Had he conveniently wiped her from his memory, or didn’t he recognize her because her appearance had changed considerably since he’d seen her last? She wanted to think the latter was the case, but still, resentment welled up like the waves on the shore. “Sorry. I didn’t need to speak to you that way. I see now you aren’t a kid at all.” His features softened when he released his grip on her arm. Melanie waited for recognition to dawn, but it didn’t come. She followed him toward the dunes, where he retrieved the kite. When he handed it to her, his brow lifted in a puzzled expression as his gaze roamed her from head to toe. “At my age, I don’t mind being mistaken for a kid once in a while.” She gazed into his eyes and saw the admiring look of a man appraising a pretty woman. She laughed, then watched as the admiring look changed to one of disbelief. “Hello, JD. I wondered how long it would take you to figure out who I am.” Staring at him, she took in the brown hair, pushed back from his face, so different from the way it used to fall across his forehead. His five-ten height had always seemed tall from her five-foot vantage point. “Thanks.” How many times had she dreamed he would say those words to her? Now that the dream was a reality, why did it seem so empty? Melanie looked toward the ocean in an effort to hide the anger and hurt she was sure he would see in her eyes. Despite all her prayers and thoughts of forgiveness, the idea of blasting him off the face of the earth ran across her mind. At the same time, she wanted her son to have a father. Making JD angry wouldn’t help that cause. “I’ll see you tonight.” Melanie tried to sound confident even though her heart pounded and her stomached churned like the nearby surf. “Sure.” He turned to go. Shaken, Melanie meandered down the beach until she came to the steps of the boardwalk that crossed the sand dune and led to the house. She could hardly believe she’d just talked with him. After all this time, it seemed like a dream. They had talked like casual acquaintances. How strange. What had she expected? Stopping at the hose, she washed the sand from her feet. She wished she could wash away her feeling of uncertainty as well. She walked into the kitchen, then plopped down onto one of the white wicker armchairs surrounding the glass-topped table. Closing her eyes, she leaned her head against the back of the chair. “Yes. Why?” Chris looked puzzled as she pushed a strand of light-brown hair behind her ear. A few hours later Melanie drove along the street leading to the main highway. Huge oaks with Spanish moss hanging from the limbs like old men’s beards and tall palm trees lined the street. As she drew closer to the restaurant, her stomach rode the waves of her anxiety until she was sure she could eat nothing. When she finally arrived, she took a deep breath and said a little prayer. Once inside, she gave her name to the hostess, who led her to the deck that overlooked the marsh, where the setting sun rested just above the tree line. Waiting at one of the tables, JD sat silhouetted against the sky, awash in pinks and oranges. He stood as she approached. He was dressed casually in gray slacks and a long-sleeved cotton shirt. “Hi, hope I didn’t keep you waiting long.” Her heart racing, she slipped into the chair he held out. He was even more handsome than she remembered. His eyes mesmerized her. Fighting against the overwhelming physical attraction she still felt for him, she glanced around the deck. How could she feel this way after all the hurt he’d caused her? She must be out of her mind. She had to keep her head clear. Dwelling on old memories now would only make things worse. She had more important matters to consider. After the waitress took their order, JD stared at Melanie and remembered how her laughter had triggered his recognition at the beach. So much was the same—her smile, her voice, her twinkling chocolate-brown eyes, and the sprinkling of freckles across her nose, but she hardly looked like the same woman he’d walked out on four years ago. “What do you mean?” She laughed nervously. “I’m sure you are, but I can’t get over how different you look.” He continued to stare at his wife. His wife. The thought brought him to the sober reality of the situation. Was she here to put an end to their marriage? She had every right. Did she hate him for what he’d done? He wouldn’t blame her if she did. What could he say to make up for the terrible way he’d handled things? Probably nothing. “Yes, Danny, your son. Or maybe you think of him as James Daniel Reid, the Fourth. You know, the baby I sent you pictures of for a year. Don’t play dumb with me, JD. He’s the reason I’m here talking with you. I don’t care how you treat me, but I’m not going to let you ignore your son any longer.” Her eyes blazed with anger. “I was so upset and angry I figured you didn’t deserve to know anything more about Danny.” Her voice raised a pitch. “You’re wrong. I wanted children. I just didn’t want them while I was traveling the world chasing after fuzzy yellow balls and the money they could bring.” Not wanting to see that look in her eyes, he put his elbow on the table and leaned his head in the palm of his hand. How could he undo this mess? He waited for another denouncement, but one never came. Finally, he forced himself to look at her again. This time sadness tempered the fury in her eyes. “I’m sorry. I didn’t know.” He wished with his whole being that things were different. The waitress brought their order, and for a few minutes their conversation halted. They ate in silence. Melanie barely touched the crab cake she’d ordered. He ate because he didn’t know what else to do. He had a son. He and Melanie had a son. Never in his wildest imagination had he thought she had asked to meet him tonight to tell him this. If only he hadn’t blocked all his social media contacts with her, then maybe he would’ve learned about his son sooner, despite the missing letters. What happened to those letters? With his pulse pounding in his head, JD watched Melanie close her eyes and place her hand over her heart. She didn’t say anything for what seemed like a century. She almost looked like she was praying. Was she going to say no? He held his breath as he waited for her answer. “Why were you so nice?” JD knew he hadn’t deserved what Melanie had done for him. “Not always. You just chose to see that side of me. You know the old saying about the jolly fat person, happy on the outside, miserable on the inside. That was me.” Melanie shrugged her shoulders and looked him directly in the eye. “Would you like to see Danny now? Love it, Merrillee! Can't wait to read all these wonderful stories!